In order to break the Jemima Code and find a place for African American women at the long table of American culinary history, I had to forget this kind of academic wrangling about whether mammy ever existed, and instead fill in the mammy outline with clues from multiple sources, including the writings of slaveholding families, because they are the ones who left written documentation of food experiences and practices — even though slaveholding families did not make up the majority in early America. Interestingly, when these women registered their thoughts, emotions and opinions in their diaries, household journals and letters to family and friends the writings contained few references to meal preparation except as part of the daily routine of plantation living. They state that household slaves were assigned various domestic duties as cooks, laundresses, seamstresses, nurses, and housekeepers. They dressed in the clothes of the family. Ate better food than field slaves. Received medical treatment, and some learned to read and write, despite prohibitive slave codes that prohibited educating them. When the mistress said, “I planted 60 acres of oats today,” she usually meant she supervised the day’s agricultural chores, not that she actually did the work herself. And, according to her texts, “Chloe,” “Aunt Rachel,” and “Mammy” all cooked. By the time the mistress’s ruminations appeared on the pages of southern ladies literature, Chloe and Rachel’s contributions, their character traits, and identity fuse into one larger-than-life, simplified woman named Mammy. And, in fiction, Mammy did everything. Mammy affirmed the abolitionists’ stance that slavery was bad while she maintained the segregationists’ view of social hierarchy. Post-Reconstruction Mammy, reflected the new social order, too. She consoled desperate housewives, assured neophyte cooks with creative ingenuity, and at the same time was the source of America’s increasing servant problem. Mammy defended the homestead. Mammy saved the baby. Mammy trained the children, and on occasion, the Misses. Mammy cooked from memory. Mammy made the best pancakes. And, Mammy set a table that invited everyone to come. If we only think about an African American cook’s lowly station of life, the minimal culinary contributions credited to her by historians and cookbook writers, and the exaggerated and distorted pictures used to misrepresent her intelligence, then it is, of course, impossible to believe that she could have been anything more than a simple laborer. Fortunately, there is an alternative view. The Culinary Institute of America’s programs catalog might define these “Mammy” tasks in a more professional way, with Kitty, Becky, and the no-named Mammy each as technicians of Vegetarian Cooking: Strategies for Building Flavor; Baking and Pastry; and Soups, Stocks and Sauces. 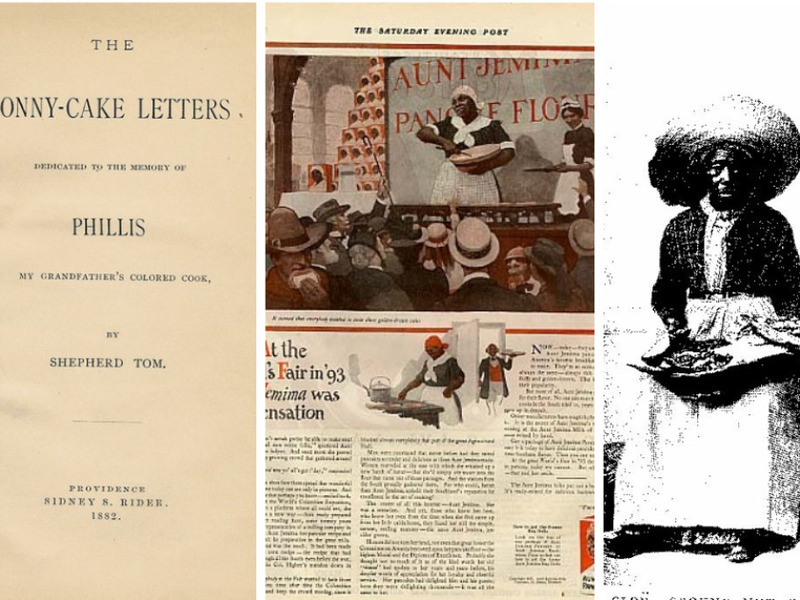 And, then there is, The Jonny-Cake Letters, Dedicated to the Memory of Phillis My Grandfather’s Colored Cook, a journal written in 1882 by Thomas R. Hazard of Rhode Island. Phillis is Hazard’s muse. She is “universally admired.” Is the “remote cause of the French Revolution and the death of Louis 16th and Marie Antoinette.” And, she reportedly bakes the most seductive jonny cake Hazard has ever tasted. Within Hazard’s exaggerated family tales are more than a few observations of Phillis’ culinary proficiency, which are so deeply enmeshed with his food recollections it is difficult to tell which comes first: his love of food or his passion for the skill of Phillis. And, it really does not matter. Phillis’ jonny cake “made one’s mouth water to look at it,” her assorted rye breads were “prized above rubies,” and this woman known only as his grandfather’s old kitchen cook from Senegambia or Guinea, was as an “artist” capable of inspiring others while tending the pot. Like the assorted mammies of Fair Oaks plantation, Phillis’ culinary talents give the black cook’s shadows some substance, and there is evidence associating Mammy characteristics with real black cooks found in black sources, as well. In slave culture, Mammy was a common name for mothers, and elders were addressed as “Aunty,” “Mauma and “Maum,” or “Mammy” as a mark of respect, not kinship. In the 1880 census the mythical Aunt Jemima is linked to at least one real, living African American woman, a black female servant who lists “cook” as her occupation and Mother Jemima as her name. The name Jemimah implied blessings and a message of hope, not subservience, according to Old Testament Scripture found in Job 42:12-14, and slaves, evidently knew it. So, I am not at all surprised that legendary cooks and ex-slaves with a worthy name were brought to life in a marketing campaign created by a couple of guys trying to sell more pancake flour. Whisk together the flour, baking powder, soda, salt and sugar. In a separate bowl, combine the eggs, buttermilk and 4 tablespoons butter. Make a well in the center of the dry ingredients and pour in the liquid ingredients. Stir together until just mixed. Batter will be lumpy. Heat a nonstick griddle over medium-high heat. Brush lightly with remaining 2 tablespoons butter, and using a 1/4 cup measure, ladle batter onto griddle for each pancake. Reduce heat to medium and bake pancakes until the top is bubbly and the edges begin to crisp, about 2 minutes. Using a wide spatula, turn pancakes over and cook on other side 1 minute longer. Do not flatten pancakes. Remove to serving platter and keep warm. Wipe griddle with paper towels, then repeat process with remaining butter and batter. This is so interesting. Thank you for sharing! This so well thought out…we (as a people) are often quick to just dismiss Mammy and hide her in an historical closet. She, or They, were always way more money under the matress than what anyone gives credit for. How fascniating that you used journals of slave owners…I like this.